The Nutrient Expert (NE) decision support tool has been successfully adapted for use in developing fertilizer recommendations that address wide diversity of soil and climatic conditions in Ethiopia, Nigeria, and Tanzania. IPNI collaborated with researchers and extension service providers from the public, private, and development sectors to develop and use NE to generate site-specific nutrient management recommendations tailored for individual or groups of smallholder farmers. Calibration of NE was based on data from 700 on-farm multi-location nutrient omission trials that were conducted in a wide range of major maize production areas between 2015 and 2016. The nutrient omission trials were designed as a diagnostic tool to identify which of the macro-nutrients N, P and K are limiting maize growth and yield, and to determine other possible constraints related to soil secondary and micro-nutrients. 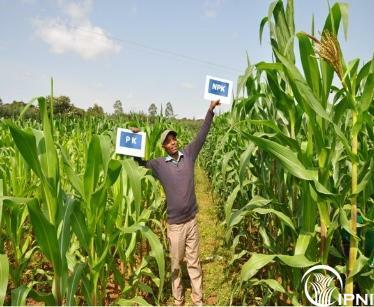 The performance of NE was tested in farmers’ fields in each of the three countries and results showed improved yields, agronomic fertilizer use efficiency and profits over farmer management practices and current recommendations.